With just 3 ingredients, it’s super easy to whip up this mouth-watering dish packed full of home-cooked goodness. When it comes to cooking an equally nutritious and delicious dinner, this is as low maintenance as it gets! And it’s a really affordable meat to buy, too. If you’re not a whiz kid in the kitchen just yet, this is a really great way to get started on building your confidence behind the cooker honing those pro-chef skills you have yet to discover! Or, you know, you could just have it for dinner for the rest of your life. 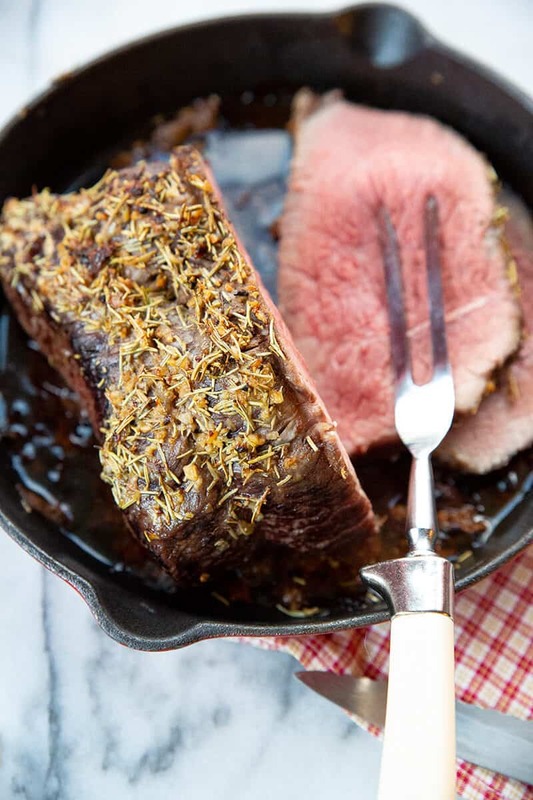 I’m not sure anyone could ever get sick of this Buttery Herb & Garlic Bottom Round Roast! Pat the bottom round roast dry with paper towels to allow the butter mixture to stick. Place the roast in an oven-safe skillet. Combine butter, rosemary and minced garlic. Spread the mixture by hand over the roast covering as much as you can. Place the roast in the oven, close the oven door and reduce the temperature to 475 degrees Fahrenheit. Roast for 7 minutes per pound and then turn the oven off completely (keeping the oven door closed). After 1 hour, turn the oven on to 200 degrees Fahrenheit and cook for approximately 1 hour or until the internal temperature of your roast reaches your desired temperature (rare, medium, etc). Is Bottom Round Roast Very Tough? Bottom Round Roast is affordable so, yes, it can be pretty tough. I mean, it literally comes from the bottom of a cow, so that makes sense! But if you cook it properly, your Buttery Herb & Garlic Bottom Round Roast can be pretty tender and delicious. It won’t be as tender as a fillet, but close enough for what you pay for it! And contrary to what many people think, it’s actually full of flavor too. Note: It’s still worth investing in an electric knife (if you don’t have one) for slicing this roast as it’s still going to be a little be tougher than a more expensive roast. Bottom Round Roast is tough for a reason. The bottom end of a cow has less intramuscular fat because it’s highly exercised (those cows have been doing their glute activation work!). If you’re a fan of red meat but want to stay on the healthier side of things, this is a great option for you and your family. What Should I Serve With a Bottom Round Roast? My advice here is to keep it simple. Why complicate something that’s already super easy to cook? Simply serve it with a side dish of potatoes and vegetables for a hearty and satisfying meal! Can You Freeze Your Leftover Buttery Herb & Garlic Bottom Round Roast? Your cooked Bottom Round Roast can last for up to 4 days in the refrigerator. But if you want it to last a bit longer, you can freeze it in covered airtight containers or tightly wrap it with freezer wrap/heavy duty aluminum foil. This easy to make Buttery Herb & Garlic Bottom Round Roast is jam-packed with flavour and I’m 99% sure it’ll end up on your regular dinner list once you give it a go (and only because 1% of you might be vegetarian!). Enjoy! 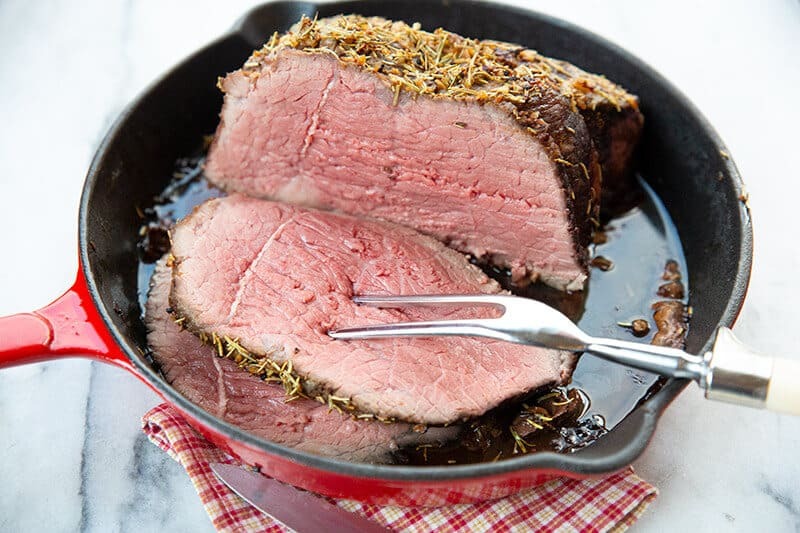 Prime Rib Roast: this juicy cooked prime rib roast is culinary heaven! 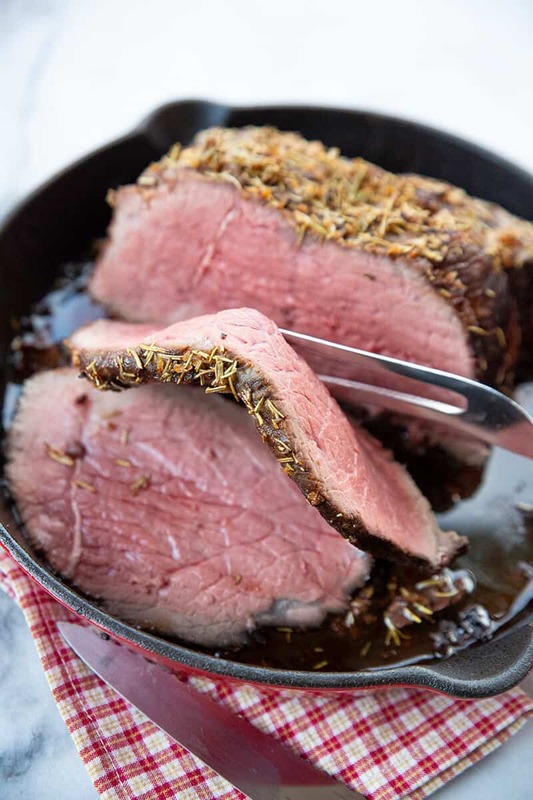 Top Sirloin Roast: cook up a fabulous family dinner with this economic roast option! Dutch Oven Pot Roast: a Dutch Oven pot roast just cannot be beaten! This yum recipe is especially nice to make during those colder months. Creamy Mushroom Beef Chuck Roast: this is the ultimate crowd-pleaser for mushroom and roast lovers with minimal time to spend in the kitchen! Dill Pickle Pot Roast & Pickle Gravy: for all of the pickle fans out there, why not get adventurous with this delicious Dill Pickle Pot Roast! 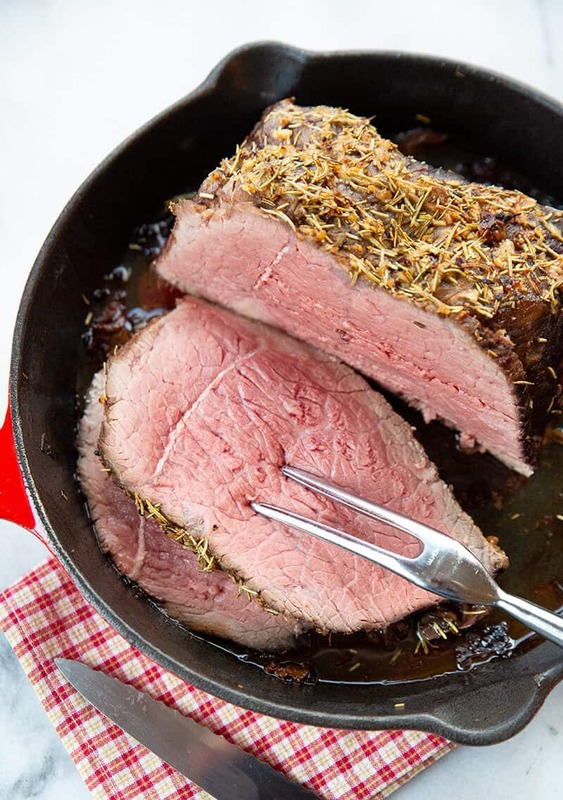 This Perfect Herb & Garlic Bottom Round Roast Recipe is a simple three ingredient roast beef recipe with a simple method of cooking the BEST roast ever! Place the roast in an oven safe skillet. Combine butter, rosemary and minced garlic. Spread the mixture by hand over the roast covering as much as you can.